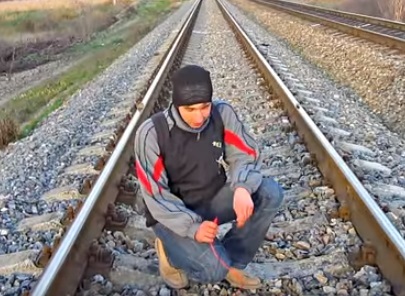 #TVisCOOL: How to charge a phone from the rail tracks. Measuring voltage on the railway. How to charge a phone from the rail tracks. Measuring voltage on the railway. I don't recommend to repeat this not to cause false railway traffic jam by mistake. All the actions in this video were performed under the supervision of an experienced railway worker. There was nothing damaged during the shooting. The description of an unusual method of charging a phone in extreme conditions for a tourist. Measuring voltage test showed that there is a small strain of about 5 Volt. It's a varying voltage transferring the code. There are quite high currents as voltage slumps during connection of the phone were not noticed. However, I don't recommend you to do like that not to cause disruption in work of railway by accident.